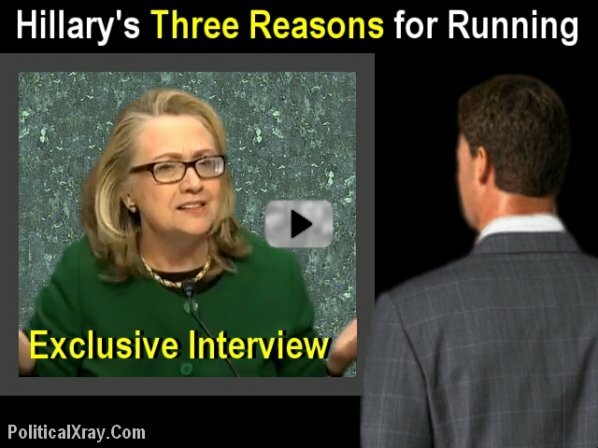 Here's a video excerpt from an EXCLUSIVE interview with Hillary Clinton in which she succinctly states the three reasons she should be elected President in 2016. Can you guess the three reasons before watching the interview? Don't cheat. First, study the clues below the video. Monica's response to Hillary: "I wish you'd said that long before 1998." Al Gore's response to Hillary: "If you had said that in 1996, or maybe even in 1992, or maybe way back in the 1980's, I would have been elected in a landslide in 2000 instead of Dubya." Bill Clinton's response to Hillary: "Ignore Monica and Gore-- it wouldn't have made any difference at all in 1998, 1996, 1992 or even in the 1980's." President Obama's response to Hillary: "I figured that out in 2008, so you're a little late to say it now, but I know you wanted to say it in 2008." Michelle Obama's response to Hillary: "I agree with Gore." George W. Bush's response to Hillary: "I agree with Bill." Fauxcohontas' response to Hillary: "You took the words right out of my mouth." Joe Biden's response to Hillary: "Mine too." Tipper Gore's response to Hillary: "I agree with Dubya." "Hey! I lived in the White House! Is there any better reason for my qualifications?" This reminds me so much about a guy who was asked why he hates "barbershop singers" so much. He said: There are three reasons: I hate it, I hate it, I hate it! Comrades, you know the drill coming 2016. Become residents of three states to vote three times for those three reasons. Those are the same three reasons I gave for firing my realtor, after she listed the three most important faktors in determining a property's value. And have three of your illegal "Americans-in-waiting" neighbors, all with their shiny new Social Security numbers and drivers' licenses, vote three times each as well. 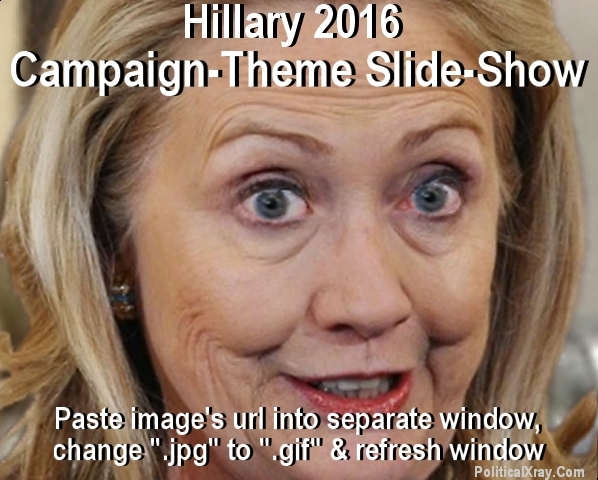 Just as the Hillary 2016 Campaign was ready to launch the first of its Campaign-Theme Slide-Shows on the Internet scheduled to commence with the "It's Time for a Woman" theme, Hillary abrubtly announced that It's Time for a Woman "will no longer be my campaign theme." Sources close to Hillary said she simply had decided it would be more effective to return to the "Republicans Would Wage a War on Women" theme that is so loved by her ardent supporters and the Legacy Media, which still feels indebted to her for having skewed their coverage in 2008 to favor Obama and disfavor Hillary. But of course our inner-party operatives have unfettered access to the initial draft for the "It's Time for a Woman", campaign-theme slide-show, which, of course, makes self-evident the reason that forced her to cancel it. Wow, KOOK! I think she is at the "R" part of saying "DERP." 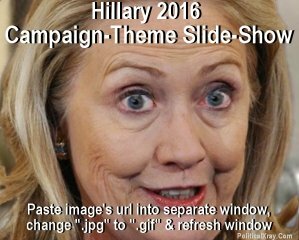 If you were temporarily blinded by the visage of Madam H, follow Kook's instructions and view the more pleasing GIF version featuring Sarah Palin. I did what you said.Wow! Nicely done! 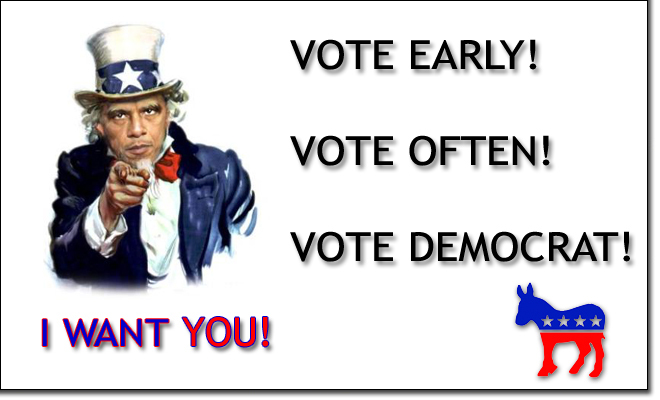 Who can save the country if Hillary doesn't: Obama 2016!